Parsec most of all is a fast-paced space shooter, where the emphasis is more on fun and action than on realism. As far as game play itself is concerned, Parsec has probably more in common with the network game play of first person shooters like Quake than with sophisticated simulations like Elite. After starting up the game you simply choose a ship and select the galaxy you want to be playing in. You can do this in a number of ways. You can either select the desired galaxy in the starmap, enter stellar coordinates, choose a gameserver from a list of servers, or enter the DNS/IP address of a specific gameserver manually. (A gameserver directly corresponds to a galaxy in the Parsec universe.) Every ship has some basic equipment right from the start, but to get most of the funky stuff like additional weapons, energy, invulnerability, and the like, you have to pick up power-ups that are floating around in outer-space. When you're shot down you lose most of them and are once again back down to the basic equipment. Other players can then reclaim the power-ups you've just lost. The basic mode of game play is deathmatch, where you simply try to collect as many kills as possible. Basically, there are no explicit game sessions, players can join and leave a game at any time. However, it is possible to set kill and time limits on the server for specific solar systems, in order to determine the winner of a game after one of these limits has been reached. 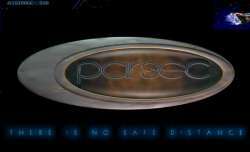 In 2003, the code was released to the public and the game title was changed to OpenParsec.